Hershey's 100% Cacao, soon also available at your local GNC? If you look at the results of the study at hand, it does appear likely that a regular "food item" can compete with sign. more expensive sport supplements. From previous SuppVersity articles you know that several studies have demonstrated the protective effects of cocoa consumption, due to its anti-inflammatory and antioxidant properties. From the news and my critical evaluations of the study results, you do yet also know that (a) regular chocolate lacks most of these beneficial effects and that the effects have (b) often been hilariously exaggerated in the laypress. Furthermore, studies that probe the efficacy of cacao or high cacao chocolate on exercise performance are, unlike studies on its anti-oxidant effects (e.g. Berry. 2010; Davison. 2012), something in-between "rare" and "quasi non-existent". In spite of its relatively small size (fifteen 15-18 year old soccer players), a recent study González-Garrido et al's latest study that examined the effect of cocoa consumption on the markers of muscle damage, oxidative stress and physical fitness in professional soccer players, is thus still worth being discussed in the SuppVersity news. Furthermore, the fifteen players (15-18 years old) were part of a case-control study in which the which subjects acted as their own control - a means of making the results more significant in spite of a relatively low number of subjects. 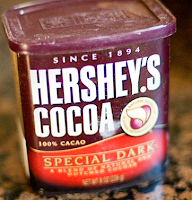 Table 1: Nutritional profile of 25g of the cocoa "supplement", Hershey's 100% cacao powder. A study in which the researchers analyzed the biochemical parameters, markers of muscle damage and oxidative stress, and physical performance before and 24h after consuming 0.375 g/kg body mass of Hershey's 100% cacao powder in 300 mL water for 7 days. Figure 1: Rel. changes (%) of markers of lipid and protein per-oxidation and anti-oxidant defenses (González-Garrido. 2015). 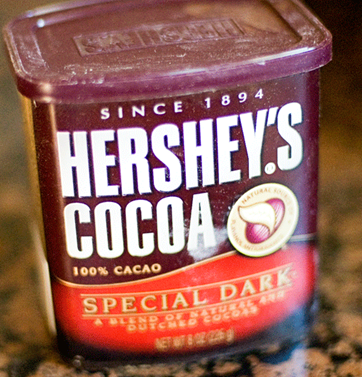 For the average study subject that was a dosage of roughly 25.1 g of cocoa per day - not exactly mass and certainly not enough to be afraid that the additional 162.5 kcal/day could have negative effects on your body composition, but obviously enough to trigger significant decreases in all the relevant markers of oxidative damage MDA + 4-HNE (lipid per-oxidation), carbonyl groups (protein per-oxidation), and improvements in all relevant markers of antioxidant defenses, i.e. 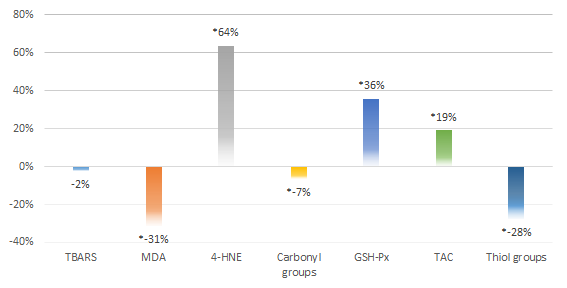 GSH, TAC (increased) and thiols (decreased). So what? Now the obvious question is: "Couldn't this impair the adaptation to exercise?" 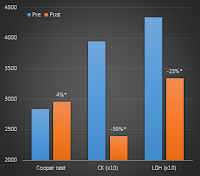 This question cannot be answered based on an acute response study, but with the acute increases in exercise performance (Cooper test, see Figure 2) and in spite of the significant reductions in CK and LDH (see Figure 2), which are usually interpreted as markers of muscle damage, this appears generally unlikely - yet not impossible. Figure 2: Copper test (test of physical fitness | more) performance and creatine kinase (CK | more) and lactate dehydro- genase (LDH) levels after the 12-minute Cooper test before and after 7-days of supplementing with ~21g/d of 100% cacao powder (González-Garrido. 2015). On the other hand, it is important to note that only the increased Cooper test performance (Figure 2), but none of the other markers has at least a non-significant predictive value with respect to the possible long-term effects on exercise performance - an effect that will have to be tested in future longer-term studies. A conclusion that would go beyond the scientists' statement that they "have shown the potential that cocoa consumption has on endurance performance and its role in recovery from muscle damage in athletes" (González-Garrido. 2015) would thus be unwarranted... as unwarranted as any speculations about the underlying mechanisms: yes, it is likely that the high polyphenol content of 100% cacao is what does the trick, but to prove that we'd need a low polyphenol chocolate control we don't have. If you want to benefit, though, I highly suggest to pick a 100% cacao powder with a low degree of processing | Comment! Berry, Narelle M., et al. "Impact of cocoa flavanol consumption on blood pressure responsiveness to exercise." British Journal of Nutrition 103.10 (2010): 1480-1484. Davison, Glen, et al. "The effect of acute pre-exercise dark chocolate consumption on plasma antioxidant status, oxidative stress and immunoendocrine responses to prolonged exercise." European journal of nutrition 51.1 (2012): 69-79. González-Garrido, et al. "An association of cocoa consumption with improved physical fitness and decreased muscle damage and oxidative stress in athletes." 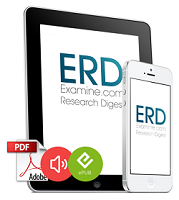 The Journal of Sports Medicine and Physical Fitness (2015): Epub ahead of pring Dec 02, 2015.